Can you share some of these alternative concepts, other then the normal 5.1 /7.1 /10.2 standards? Oli: Those formats are cinema formats. Over the last ten years a lot of people in academia have started working with Ambisonics. The University of York’s Music Technology Group has a long history of research into Ambisonic technologies, and we developed some of the first plug-ins for this purpose. Of course many electroacoustic composers work with quadraphonic and octophonic set ups and there are established centers such as GRM in Paris who are famous for doing concerts using orchestras of loudspeakers. There is also wavefield synthesis, which isn’t as common because of the sheer number of speakers required. Both wavefield synthesis and Ambisonics attempt to recreate a soundfield where as the other formats are more concerned with individual speakers. Tony: But primarily, we’re trying to integrate a series of existing techniques to their best effect. One issue which a former PhD student, Peter Lennox, and I have investigated and published at AES and ICAD conferences, is audio spatial perception and how this might impact the techniques used to create surround which is believable and appeals to our human perception mechanisms – as far as contemporary research in that field might suggest. We’ve looked at new models of perception and considered how developments in perceptual research, psychoacoustics and neuroscience might influence how we think about approaches to the creation of spatial sound. It seems that spatial information within surround sound content is very important for our ability to hear spatially, as is appealing to our cognitive abilities, what R. L. Gregory refers to as “top-down” knowledge which informs our perception. There are many aspects to these approaches, which are documented in our papers, but as an example: we tend to explore environments to uncover more information about any spatial anomalies we might experience. Any surround system predicated on a sweet spot generally presents the listener with less spatial information when they move. 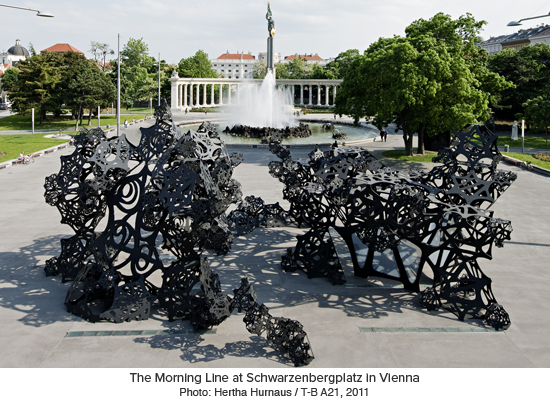 In the generation of works for the Morning Line we try to establish spatial cues across the sculpture, to establish an audio perspective by using multiple sound fields and near, middle and far field loudspeakers. The local surround environment is coherent, but its relationship to far fields can be established by listeners moving. This provides additional information about the location of distant and mid-field sounds as a listener moves through the sculpture, and seems to establish a more cohesive spatial sound experience. We put those ideas into practice to develop the Morning Line sound system, which consists of 41 small, main speakers and 12 subs, made by Meyer Sound. These are all controlled from a Mac Pro, and run from a very, very large Max patch, that can create, potentially, hundreds of different trajectories of sounds or different sound locations across the structure. It’s what I’ve been calling a multi-spatial sound system. It’s not like a conventional surround system that just surrounds the audience. It actually has multiple zones and surround cells, so that when you walk through it, you’re able to get a different perspective of the relationship between sounds, and the way that the sounds are spatialized. We’ve published an AES paper on the basic outline of the system and a paper at this year’s ICAD conference about the modular spatial technique. Can you share some of the trials & tribulations of working in surround? Oli: One of the main issues for us and many of the artists that we work with is the lack of proper support for the kind of surround work that we do in most digital media formats and DAW software. There are very few DAWs that allow flexible channel routings and this can be a real problem when working with non-cinema surround. Often it is frustrating working with and developing panning plug-ins since most DAWs that do support surround assume you want a particular speaker configuration based on one of the established cinema formats. Hopefully since technologies such as Ambisonics are being used more and more outside of academia, this might change. We feel that surround has much more to offer than what is currently found in cinemas and home cinema setups. Such as your multi-spatial system? Oli: The Morning Line spatialization system has different goals to other systems, in that normally we are not trying to precisely recreate a soundfield for a listener sitting in a "sweet spot", but rather, to create a flexible, multi-area spatialization platform that works for a variety of artistic approaches, and that can be explored by visitors walking around the sculpture. The sculpture has six areas that we call "rooms". When someone is in one room they will hear what is going on in that room, but also what is happening in the other rooms. The Morning Line itself is a modular system and it has been in a different configuration for each of the three installations which means that the speaker positions can change. Due to the layout of the rooms we cannot always put speakers in so-called "regular" arrays, which are generally preferred for spatial audio rigs. Four of the rooms are three-dimensional and two are two-dimensional. We have to accommodate these things and therefore we have opted for an approach which can transfer between different setups and that doesn't assume a particular speaker configuration. Mostly we use Ville Pulkki's Vector Based Amplitude Panning, and associate azimuth, elevation and diffusion (sound spread) trajectories to mono audio sources, but our software allows for stereo, linked trajectories too. This data plus the audio is refereed to as a "spatial audio object" SAO file, which can be transferred from one room to another, or used across the whole sculpture. So in comparison to other systems, in a way, The Morning Line encourages artists to think about the different relationships between sounds in different areas, rather than one area that surrounds the listener. In terms of the actual experience of using the system, it is quite liberating when compared to working in a DAW on a traditional 5.1 system or similar. Did Max play a part in these solutions? 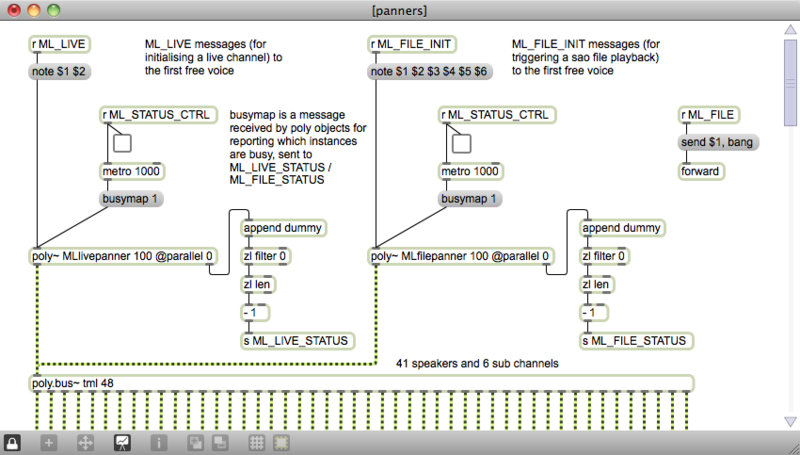 Oli: We have found the multichannel audio support in Max/MSP 5 to be very solid, both in terms of playback of many simultaneous hard disk audio tracks using sfplay~ and the interaction with the audio driver. 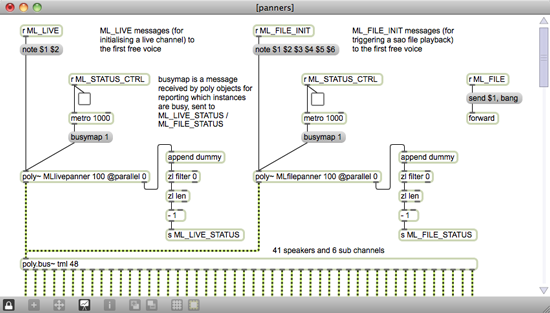 Also the maturity of Max/MSP as a DSP system means that we can accommodate lots of different approaches and have access to a variety of spatialization techniques, many of which have been implemented by members of the Max/MSP community, thanks to the well written and well documented SDK. Do you have any Max-specific, surround / specialization tips, tricks or warnings? Oli: When working with complex multi-channel audio in Max/MSP it's appealing to use send~ and receive~ to reduce the number of wires but in the current version you have to be careful about how you use those objects inside poly~, due to two things: stuck buffers when dynamically turning on/off voices and a potential time delay being introduced. Obviously this is very important for our work, since it is crucial to maintain phase coherence and timing between channels. We use the poly.bus~ and poly.send~ externals from CNMAT which work around these issues. Also, as a further note, when using lot's of sends and receives in a big max patch, it is important to name them methodically and maybe even keep a separate record of the send/receive names and what they're for. Obviously you don't need to worry about a mono or stereo fold-down, but do the phase relationships of so many sources come into play at all? Are you able to use and manipulate these relationships to your advantage? Oli: Well, it really depends on the composition. Certainly some composers have deliberately used phase relationships in their pieces for The Morning Line, and we have had to be very conscious of phase issues so as not to produce any unwanted effects. Tony: We also use Max to do all the things PA System Technicians do to phase compensate loudspeaker arrays and adjust timing and frequency anomalies. I'm going to look further into poly~ it sounds like an amazing tool to master. thanks for the tips on send~ and receive~ as well.